HÀ NỘI — Hanoians have seen a greener Hà Nội with nearly 930,000 new trees planted along local streets over the last two years. Green trees seem to cover the city, from the inner district streets of Đinh Tiên Hoàng, Trần Nguyên Hãn, Lý Thái Tổ and Điện Biên Phủ to outskirt district roads of Võ Nguyên Giáp and Võ Chí Công – the roads leading to Nội Bài International Airport. This greener atmosphere is a result of the city’s programme to plant one million trees across the city between 2016 and 2020. They include orchid trees, freshwater mangroves, maple trees and camphorwood trees. The city administration had planned to speed up progress to meet the target before the deadline, said Lê Văn Dục, director of the city’s Department of Construction, at a Tuesday meeting, Hà Nội Mới (New Hà Nội) newspaper reported. Vũ Kiên Trung, general director of Hà Nội’s Green Tree and Park Co Ltd, said the company had planted nearly 500,000 trees in 2016 and 2017 alone. The trees planted along Võ Nguyên Giáp and Võ Chí Công were a good example for other roads. Nguyễn Thuý Nga, a resident of Hoàng Mai District, said she was amazed when she was on the way to the Nội Bài International Airport recently. 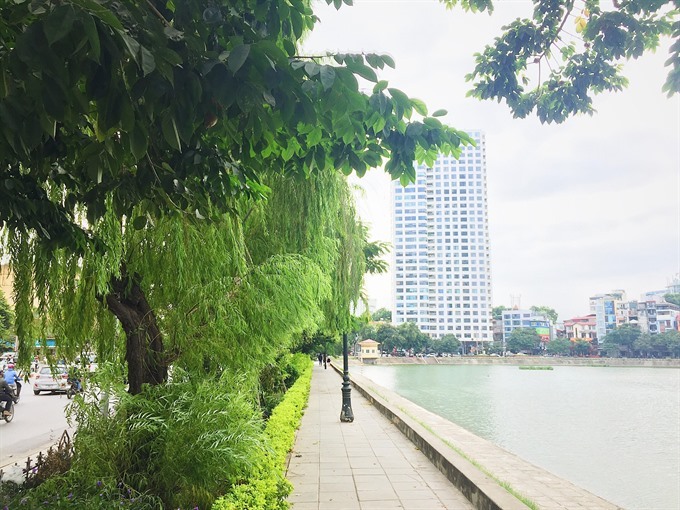 Trần Ngọc Chính, president of the Việt Nam Urban Planning and Development Association, said he appreciated the programme and its target of improving the environment and quality of life for local residents. The city’s decision to only plant one kind of tree along each street was very suitable, he said. According to the company, the city has allowed it to buy 15 modern machines to prune trees in the last two years. About 80,000 trees were pruned in 2016 and 2017, up from 3,000-4,000 in previous years. Pruning and taking cares of trees helped minimise damage caused by falling trees during the rainy season and improved the image of the city, the company said. Nguyễn Đức Mạnh, deputy general director of the company, said the modern machines meant the company could quickly address customer complaints about old or damaged trees. According to the National Parks Board of Singapore, trees provide a multitude of environmental, social and economic benefits, and are an important foundation for a liveable and sustainable city. Trees help reduce ambient temperatures in urban environments by providing shade. They are improve both air and water quality by absorbing pollutants, intercepting particulates, releasing oxygen, reducing ozone levels and reducing soil erosion. Trees are an asset for storm water management in a city. Urban areas tend to experience a large amount of storm water runoff because they have large areas of impermeable road and building surfaces. By capturing some of the falling rain with their leaves and increasing the capacity of soil to absorb rainwater, trees reduce the strain on storm water drainage networks.